Durban - The Titans ended the second day of their Sunfoil Series encounter against the Dolphins a massive 392 runs in arrears, having stuttered their way to 156/7 at Kingsmead. The Dolphins piled up 548/6 declared, with two centuries and four fifties to show for a rich harvest at the crease. The home side had resumed on Friday on 323/3, with Vaughn van Jaarsveld standing tall on 140 not out. The powerful left-hander added a further 20 runs to his score, before being needlessly run out by Rowan Richards, with a double ton there for the taking. Van Jaarsveld had ridden his luck at times during his five-hour knock, but he was full value for a display that included 23 fours and a six. At the other end, Khaya Zondo (69) helped himself to a steady 50, before giving it away with a lazy shot into the gully. While Zondo was settling in, Cody Chetty was running riot on the other hand, as he breezed his way to a 68-ball fifty, studded with seven boundaries. Once Zondo departed, Chetty really cracked on the pace, as the Dolphins reached lunch on 454/5. After the interval, skipper Daryn Smit and Chetty racked up a quickfire 96-run stand for the sixth wicket, with the former passing 50 from just 58 balls, and Chetty going to a maiden franchise ton off 112 balls. Smit declared as soon as he was caught trying to play the "Dil-scoop", and the Dolphins bowlers were then let loose on a tired looking Titans' team. Inevitably, there was an early wicket as Pieter Malan was trapped on the crease by a good, swinging delivery from Mthokozisi Shezi. Tumelo Bodibe (41) tried to stay positive during his battle with a charging Kyle Abbott, and survived a few, vociferous appeals for leg-before, before eventually falling in that fashion after tea. Heino Kuhn was also rapped on the pads, this time by the skiddy Craig Alexander, as the Titans top-order was blown away. What would have been especially disappointing to the visitors was the manner in which their two current Proteas batsmen, Henry Davids (9) and Farhaan Behardien (8), departed. 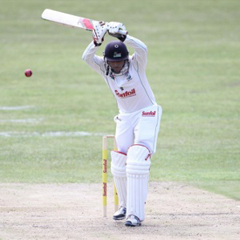 The latter slapped a limp pull to mid-on, while skipper Davids hung his bat out to a very wide Calvin Savage delivery, as the visitors crashed to 73/5. Mangaliso Mosehle (39 not out) and David Wiese (12) held up the procession for a while, before Wiese was well held by Zondo at square-leg off Alexander. Mosehle, driving and flicking with his usual flair, fought fire with fire, and found a willing partner in Roelof van der Merwe (27), and they added 50 for the seventh wicket. Van der Merwe was the last wicket to fall, as he gloved Savage to Zondo in the gully, ending a fine day at the office for the Dolphins. Abbott (two for 34) and Shezi (one for 45) bowled with great discipline, and they will be eager to wrap up the Titans' first inning early on day three.